Just saw KCK today and I haven't even reached home, but here I am writing about it! This is one of the few movies that I've seen so close to its release ..2nd day, 1st show! Quite surprised at my own eagerness to watch it. But that's how I am. I go by instinct, on such things. Coming to KCK, I don't want to reveal the storyline (no spoilers, here!) - but its a nicely done movie. It has its fair share of laughs, thrills and meaningless (avoidable) moments. My kudos to the Director, who actually got the audience to clap in the last shot - I was truly amazed! The movie could have done away with about 10 minutes, making it crisper, but I don't know whose responsibility that is - the Editor's or the Director's. I was really impressed with the acting. Farhan is very, very believable in the role. His angst in certain scenes, esp when he breaks down and cries when on the phone, is truly classic. Deepika - well, what can I say - this girl is growing on me. She caught my fancy in Love Aaj Kal and has done it again here. However, she's again cast as an independent minded woman - and is convincing. Her earnestness comes across genuinely. I quite liked the music by Shankar Ehsan Loy. In particular, the music that plays while the opening titles appear, is particularly catchy. Incidentally, the titles are done quite innovatively, too! Don't expect a love story (though it has its moments). Don't expect a laugh riot - its not a light movie, by any standards. Don't expect an outright thriller - even though there are more than a few times which will make you jump! I don't think its worth a second watch, but I'd enjoy watching the DVD - and would definitely buy the Audio CD. All in all, an enjoyable fare - as we say, 'paisa vasool'. 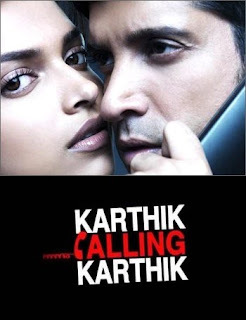 Karthik Calling Karthik is a brilliant movie. Both Farhan and Deepika have acted very well. Also, I don’t know if you are aware that ‘Bausch and Lomb’ following the movie is running a ‘Bausch and Lomb Karthik Calling Karthik Contest’, where B&L is giving you the chance to get a mini-makeover and still photo shoot by Sushmendra Dubey, a leading photographer. All you have to do is join the official Bausch and Lomb KCK contest fan page on Facebook, submit your profile picture and stand a chance to win a free photo shoot with a leading photographer and be featured as our Bausch & Lomb ‘Model of the Week’. Another good movie added to Farhan's acting career.